Most people use their main heroes to do logistics work or convert to Siege hero. However, with Brother-in-arms, your main hero is now a very powerful combat hero with crazy Area of Effect ability. Please start converting your main hero into a fighting machine. Rebirth and reassign stats to Leadership or Power, Enhance stats to increase Leadership or Power, give equipment to boost Leadership/Power, give ability for combat, passive abilities are preferred. 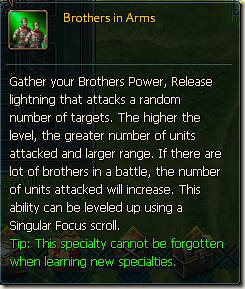 The Brother-in-arms ability is similar to Pang Tong Thunder Fury, and it can actually be much stronger if you organize with your brother well. As described, the number of brothers from the same garden on the battle field affects the number of targets. To maximize this ability, create a mailing list of all your brothers (in the garden). 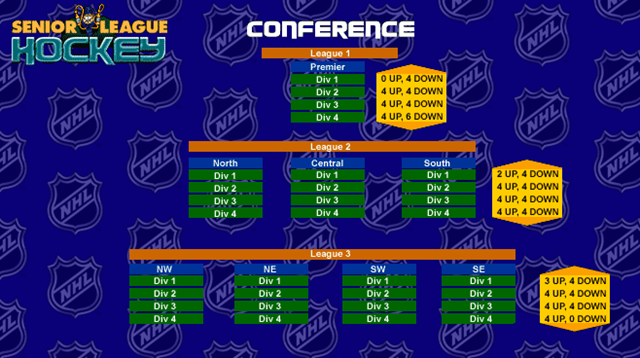 Coordinate and place all the main heroes of the 10 brothers in the same city. The stats of individual hero may not be great, but together, the effect will be fearsome. It will be like 10 Pang Tongs that hits 10 targets when the ability triggers. 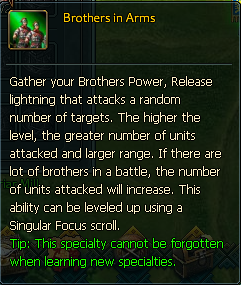 Requirement: when you main hero gain more than 40 loyalty (so 41+), the skill singular focus will change to brother in arm after server maintenance at 4am. Additional note from MingLi about the Tavern : some peoples say that after loyalty = 40 you need at least 5 members to greet each day or loyalty will decrease faster than it increase. Yesterday we saw How to Enhancing & Upgrading and Tuesday we learned how to recycle, today we dig a bit on 2 other addition in the gear enhancement, Refining and Tempering. 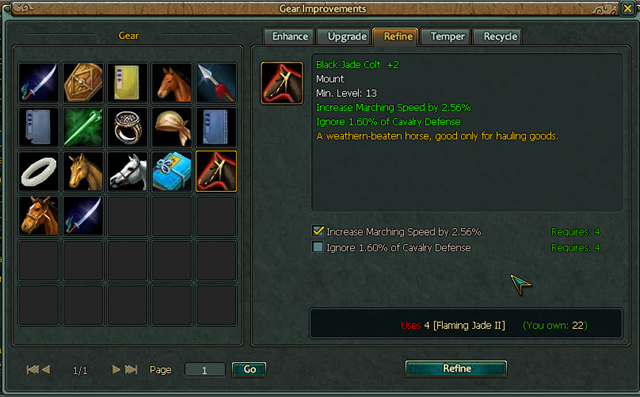 Refining uses flaming jade to replace a stat or bonus of an item with a new random stat or bonus. 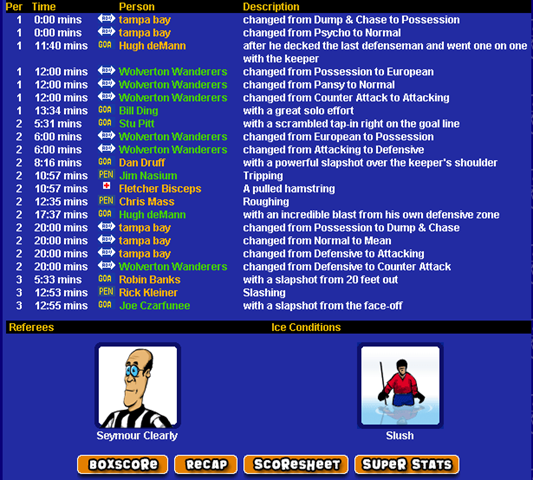 The player is able to select the gear’s stat which will be replaced. 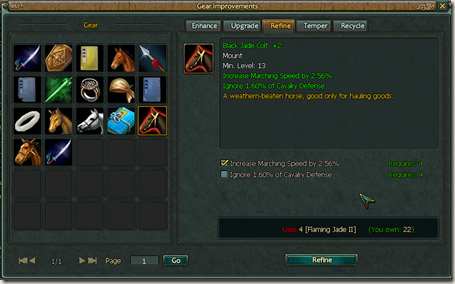 There is no risk to losing the gear using this feature.There is no limit to how many times an item can be refined. 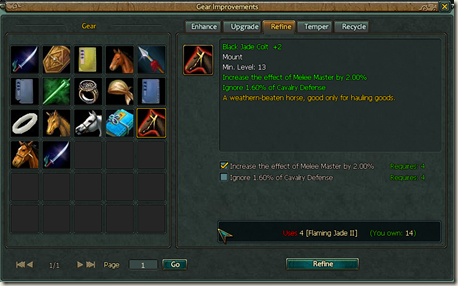 Mounts may now have their “Increased marching speed” replaced with a new stat or ability. It’s very useful to remove skill you don’t for other skill or to improve mounts as by removing increased marching speed for something else. White – 4x lvl 1 flaming jade per attribute change. 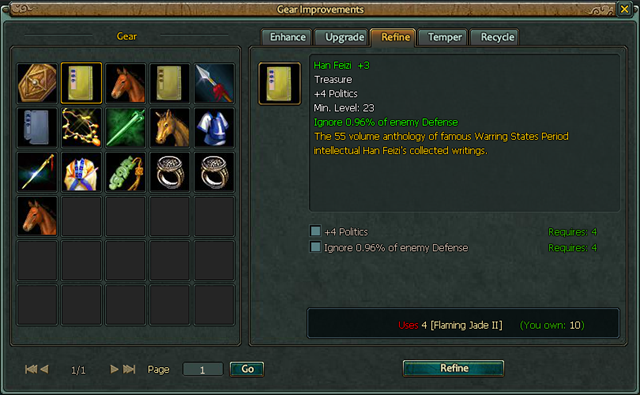 Green – 4x lvl 2 flaming jade per attribute change. 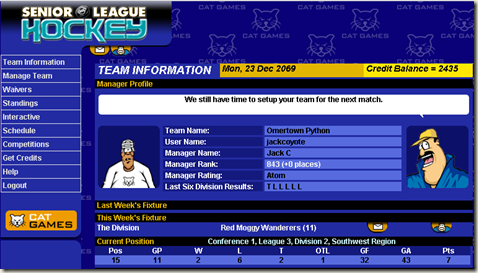 Blue – 10x lvl 3 flaming jade per attribute change. Purple – 13x lvl 4 flaming jade per attribute change. Tempering increase the quality of you gear from crude to common (white to green gear) . 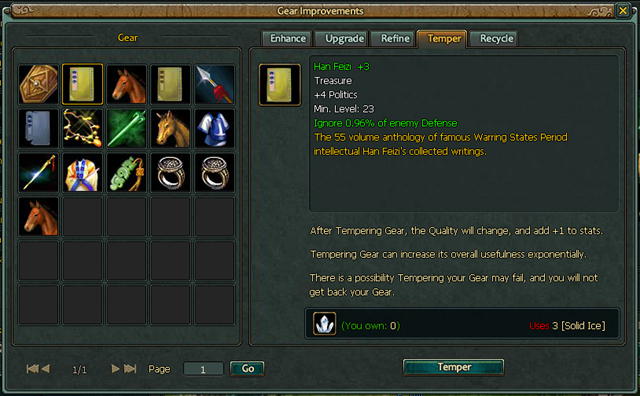 However tempering is gamble since gears can be destroyed using this feature! So, if you do not want to lose a particular gear, do not try to temper it. I wasn’t able to actually try this feature yet because I wasn’t able to get any solid ice. From what I’ve heard from other player it basically upgrade the color of your gear giving it a additional bonus. 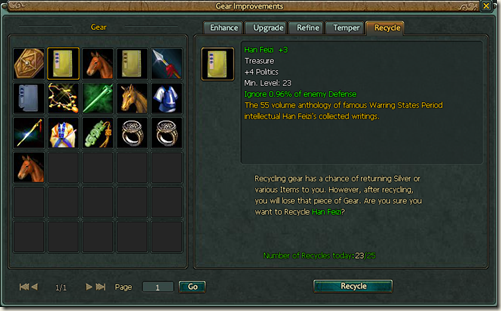 For example you can make a green gear become a blue gear therefore it gains an additional stat or bonus. 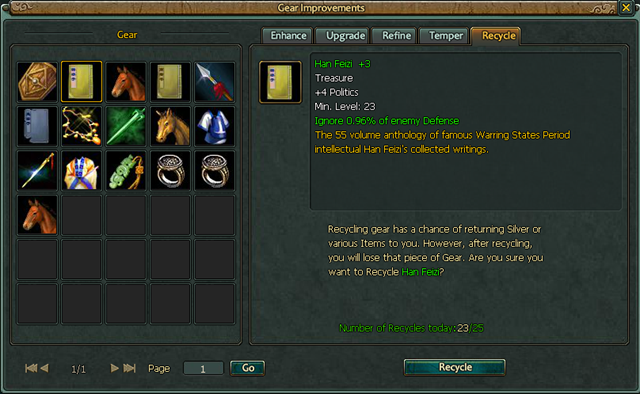 Yesterday we saw How to recycle, today we dig a bit on 2 other addition in the gear enhancement, Enhancing and upgrading. It seems the same system has it used to be the max level of gears remains +10. Mithril: Increases the enhancement level of gears. Minor Mithril: Increases the enhancement level of gears upto level +5. There a Rumor has it that the chances of enhancement have been reduced since mithril is now easier to come by because of recycling. 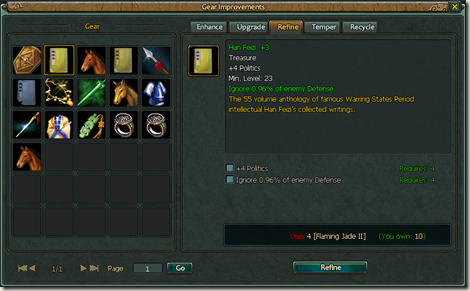 Check this link to the forum to have more info on how to enhance gear. This is were you use your Yin Jades from the recycling. What nice with upgrading you won’t lose any gears when you do it. 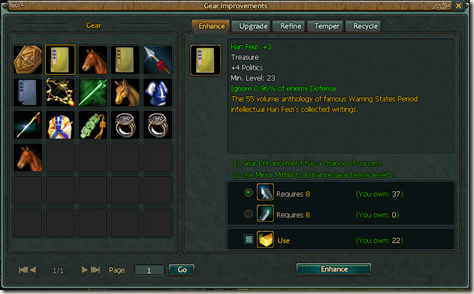 Hope you liked this guide, I’ll bring another guide on gear enhancement tomorrow about tempering and refining. Note: any resemblance to Death Guide is purely coincidental(lucky the auto-correct knew that one) in some part, inspirational in some other and almost identical in rare occasion. If you want to check the original gem go here and tell Death that he’s awesome. Surprisingly Recycling is not just something of the modern age it something they use to do in the past, in the three kingdom period particularly. Or maybe it’s just that Koram is going green and is making us recycle our old gear to prevent pollution and and improve our other gear in the process. 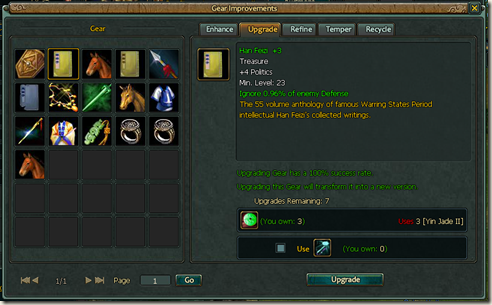 Item recycling is the last tab within the gear improvements. Each player is able to recycle up to 20 gears per day. That mean that if you don’t have gear to recycle you can always buy every gear in the mystery shop for that day then recycle. You won’t get much but is better than nothing. 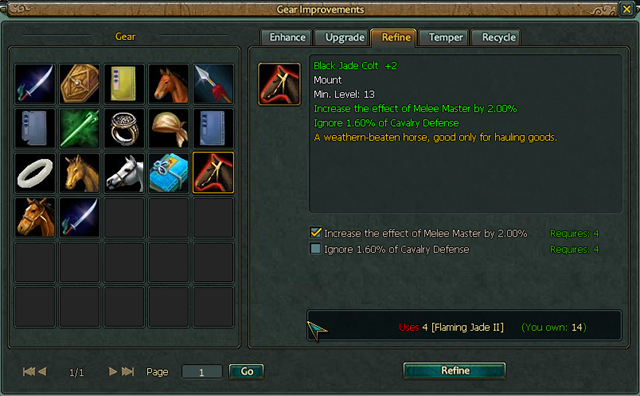 In return you will receive a variety of jades which are essential to making improvements to the gears you wish to use in battle. Only recycle items which you no longer want or need since they will be destroyed. 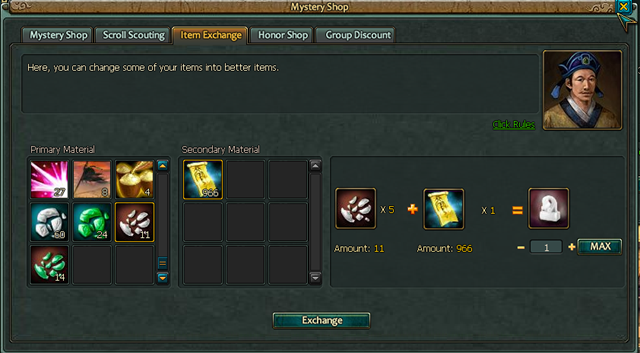 If you need all your current items, I would recommend buying cheap items from the Mystery Shop for the sole purpose of recycling. Here’s a list of the different items you can get for recycling. 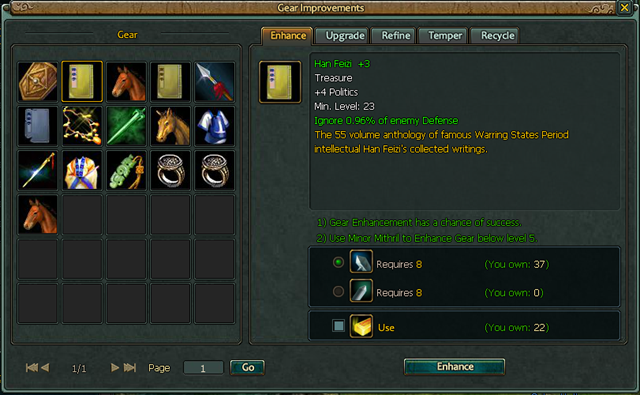 I find higher quality gears provide better chances at gaining high level enhancement items. Yin Jade: Used to upgrade gears, ranges from level I to V for white to orange gears respectively. Flaming Jade: Used to refine gears, ranges from level I to V for white to orange gears respectively. Yin Jade Fragments: exchange multiple fragments for yin jade of the same level. Flaming Jade Fragments: exchange multiple fragments for flaming jade of same level. 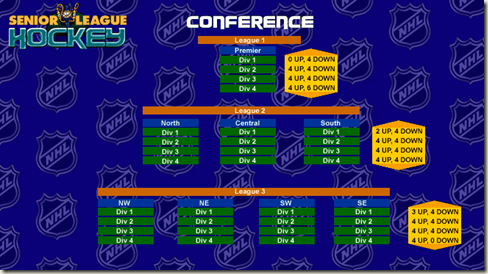 Solid Ice Fragments: exchange multiple fragments for solid ice. After you have recycled enough gears, its time to trade in your fragments for actual enhancing items. 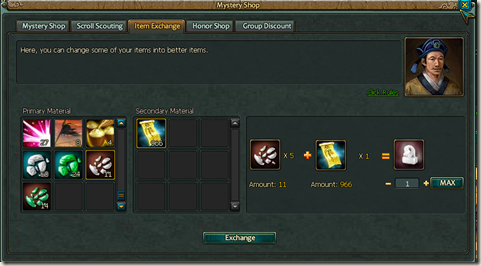 Go to the mystery shop and then item exchange tab. Below all your scrolls you will find the fragments which can be exchanged using minor scholars scrolls. Have fun recycling, next I’ll explain enhancing and upgrading our gear. Disclaimer any resemblance to Death Guide is purely coincidental(luckly the auto-correct knew that one) in some part, inspirational in some other and almost identical in rare occasion.